Sunday morning with antsy dogs, but I'm holding firm on the couch with my post. My class starts at three: garden roses designed in baskets. The sun came out yesterday, but I missed the shot of the light on my pink wisteria. The clouds are thinning though this morning; I might get a chance before I leave today. 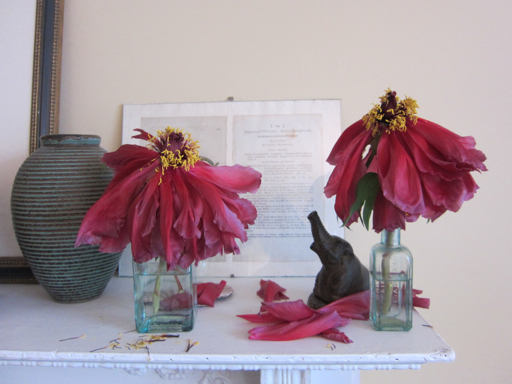 I did, however catch the last petals in my tree peonies. Not officially 'flowers in the house' week, and wish I was Irving Penn...still...something pagoda-ish about these. Or bridesmaids in garden hats (in the Virginia humidity!) What a wonderful color! Don't you love a flower that dies gracefully? So beautiful. Like a still life. I can't wait to see photos from your class! These are the roses from Rose Story, right? So exciting!! Roses: A famous survey denotes that the most broadly favored shading is the inherently classic rose. Most women the world over favor roses to different flowers on Valentines Day from flower delivery for valentine day. Dark red shaded ones symbolize passionate and intimate romance. Lately, women have shown inclination for colors other than the conventional red. Peach is for appreciation so is the shading orange while white roses symbolized honesty and virtue. In the event that you have no clue what holiday gifts to get and what might make extraordinary holiday gifts like christmas day flower delivery same day , discover suggestions on or disconnected on the best gift ideas and where to discover them or focus on any hints dropped by family and friends keeping in mind the end goal to set up a list of the best Christmas presents.